Investors dropped gun stocks earlier this week like a hot potato following news that pre-purchase FBI background checks dropped 13% in May. The conclusion for many is that the great gun-buying boom is over. Not so fast. I don't do politics, so don't make the mistake of assuming what I am about to say is politically charged. I'm simply going to lay out the facts as they exist today. And, as usual, point you to yet another great investment opportunity. The company that I recommended the last time we saw this playbook is beating the S&P 500 by 18-to-1 so far. If you'd like that kind of performance in your portfolio, then read carefully. The last time a politician took aim at the gun business, it doubled during the worst financial crisis in recent memory. And it will again. 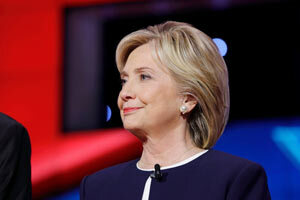 Last October, I told you that presumptive Democratic presidential candidate Hillary Clinton could be the greatest millionaire-maker of all time if she assumes the mantle of "world's best gun salesman" from outgoing President Barack Obama. As you might imagine, my comments unleashed a blizzard of commentary. I have no doubt that today's column will ruffle a few feathers, too. But that's a good thing, for the simple reason that the best investment opportunities always come from chaos. We talk about this a lot because of something I call the Total Wealth Principle of Divisiveness. If you've never heard me use that term before or have just joined us, what I mean by that is very simple: The more divided people are about an issue, the bigger the opportunity at hand. You'll know you're on the right path to profits when emotion, mockery, and moral superiority are used to "prove" the point instead of the cold, hard logic and data we know leads to huge profits. The important thing to understand is that a direct correlation exists between the scale of social discord and the size of the opportunity at hand. Most investors can't put aside their emotions, so they never make this jump, nor, unfortunately, do they capture the profits that could be theirs for the taking. Take Big Tobacco, for example. The industry coughed up a staggering $208 billion in 1998 as part of a landmark settlement reached by 46 Attorneys General and has bled billions since then. People thought the industry was best left for dead. Yet, a savvy few made their move. An investment in Altria that same year would have returned 610% to date – not including dividends – compared to just over 100% for the Dow over the same time frame. Factor in dividends and reinvestment and the tally jumps to a jaw-dropping 1,634%. America spent billions in a futile effort to eliminate alcohol consumption, beginning in 1920. Yet by 1923, a scant three years later, consumption had already risen to 70% of pre-ban levels. Coca-Cola sales tripled, and Charles Walgreen's chain of local neighborhood drug stores expanded by 2,525% to 525 stores in less than a decade. Both companies have minted plenty of millionaires since. Divisiveness works because politicians perpetually underestimate an industry's will to survive. So they duke it out using social shaming and self-aggrandizing sound bites intended to generate votes and contributions when what they really should be doing is tackling the economics of how consumers, suppliers, and regulators interact. They suffer from the mistaken belief that "they know better" than the rest of us when it comes to what the public wants. We see this dynamic with guns today. What you need to understand is that guns made this country. Like it or not, they're part of our national DNA. That means any politician who comes for them is going to boost sales to previously unimaginable levels. Democrat or Republican – it makes no difference. President Obama, for instance, has made no bones about his feelings on the matter, calling for "common sense" ownership during his tenure. Incredibly, his elections have proven to be bigger catalysts for gun sales than even the horrific events of 9/11. 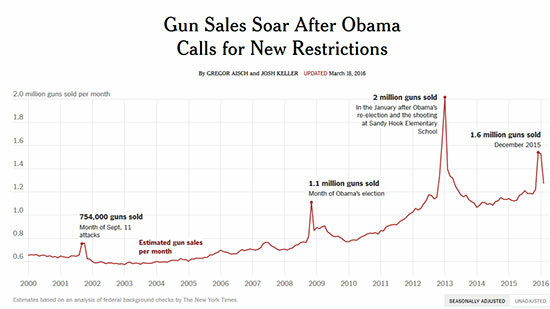 I'd even go so far as to say that he almost singlehandedly created a gun-fueled economic boom during the darkest days of 2008-2009 that started before he took office and which continues today. Ergo, what the FBI data really tells you is that the industry is struggling with good times – not that it's failing. 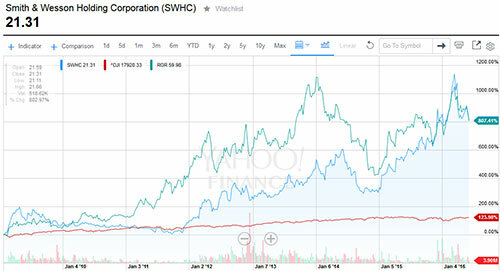 Smith & Wesson Holding Corp. (Nasdaq: SWHC) has returned 800% since Obama's inauguration in 2009, while Sturm Ruger & Co. Inc. (NYSE: RGR), also shown, isn't far behind. The S&P 500, by comparison, has tacked on only 123.98% over the same time frame. That depends on which presidential candidate treads most closely to the very fine line between a monopoly on violence and fear of limited possession. At the moment, that's newly-minted presumptive Democratic nominee Hillary Clinton. She likes to speak frequently on the campaign trail about her vision for gun control, pointing out her votes in the Senate to ban assault weapons, and even a proposal to raise the legal age for handgun ownership to 21. The best way to play Clinton's rhetoric, in my view, is to use the current pull back to buy gun stocks. There are two pure-play – albeit very speculative – choices here in America: Smith & Wesson and Sturm Ruger. Ruger is the better alternative at the moment, especially if Clinton looks like she may trump Trump. The company has the stronger balance sheet, stronger cash flow, and $80.46 million in cash, according to Yahoo! Finance, which gives it plenty of staying power under challenging economic conditions – not to mention a direct political assault on its products. I also like the fact that Ruger seems to have the more aggressive management, and that means plenty of new product introductions, including new handgun and rifle lines at a time when Smith & Wesson seems frozen. I think Ruger goes aggressively after market share in the months leading up to elections. Finally, Ruger kicks off a 2.24% dividend versus no dividend from Smith & Wesson. That means you're going to receive cold, hard cash in exchange for the risk you take as an investor. Now, there's a lot of concern being raised at the moment about dividends in general and whether or not a company in question can sustain them given declining earnings in many industries. While there's no hard and fast answer, you can look to something called the payout ratio as a means of judging that. Ruger's payout ratio is just 35% according to Yahoo! Finance, which means the company devotes just over a third of its profits to shareholders in dividends, versus a company like Coca Cola, which has a payout ratio of 80.93% and is clearly at risk because it has to spend so much money to meet its obligations. …we'll have a new Congress come January 2017, too. 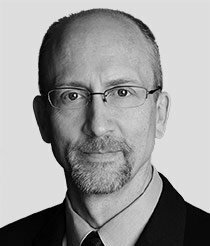 Editor's Note: Companies like RGR will continue to dramatically outperform the broader markets – and line their shareholders' pockets – for as long as they're backed by at least one of the six "Unstoppable Trends" Keith has uncovered in his 35-year investing career. In fact, the Trends are so powerful, no force on Earth can stop them from enriching investors who know how to channel them. To read more – and gain full access to all of Keith's investing insights – sign up here for his free e-letter Total Wealth today.